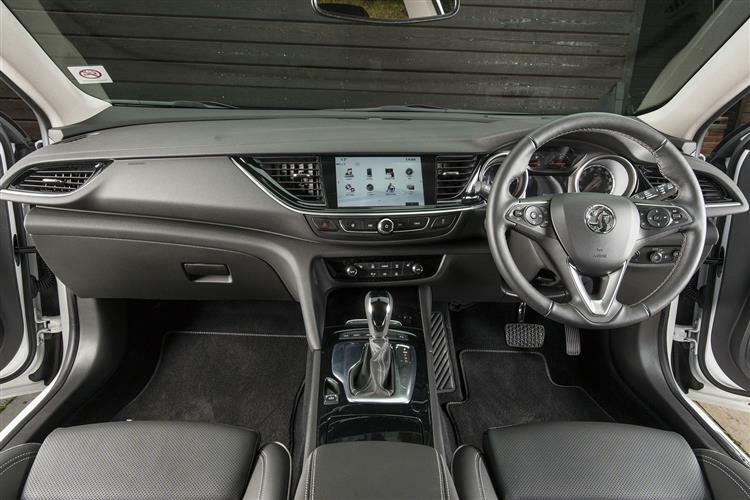 The second generation Vauxhall Insignia Country Tourer swells the ranks of mid-sized, ruggedised all-wheel drive estates. Jonathan Crouch reports. The hunting and shooting set tend to pride themselves on their old money discretion. To the truly wealthy, a car is a battered Subaru, possibly a dog-eared old Volvo estate or possibly a mildewed Land Rover. It's probably fair to say that a Vauxhall is just too effective a disguise for their status and the latest Insignia Country Tourer is a bit chrome on the range for the proper country set. That said, cars like the Volkswagen Passat Alltrack and the Audi A4 allroad, the models that popularised this genre, are also a bit new money to be taken entirely seriously. So while this rugged-ised Insignia is actually a bit more Basildon than Balmoral, it's nevertheless a welcome addition to this class. As contenders in the 4x4 estate segment have become ever pricier, there's room beneath for the genuinely likeable Vauxhall. As a one-car fits all solution for the active family, this one's got a lot going for it. 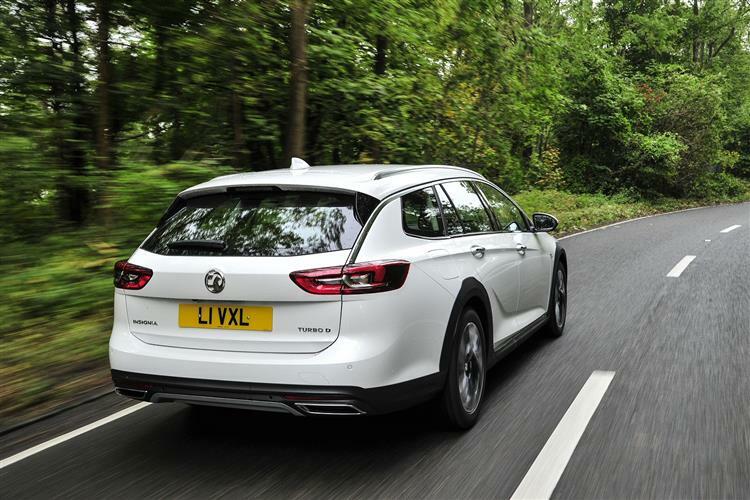 Most Insignia Country Tourer models will be ordered with a 2.0-litre diesel engine - there's a choice of two. The 170PS unit offers 400Nm of torque, enough to get you to 62mph in just over 8s on the way to 140mph and if you want to improve on those figures, a biturbo 210PS version of this engine is also on offer. That top variant only comes with the all-new 8-speed automatic gearbox that's been freshly developed for this second generation model. This Country Tourer variant features additional ground clearance of 20mm, plus all-wheel drive with torque vectoring and a freshly designed five-link rear suspension system. Instead of a traditional rear differential, this Vauxhall boasts two electrically controlled multi-plate clutches that enable a more individual and precise transmission of power to each wheel. To stabilise the vehicle and counteract understeer on tight corners taken at higher speeds, the system can send more torque to the outside rear wheel without further driver intervention. The improved FlexRide chassis provides the basis for changing road conditions and driving behaviour. It adapts the dampers, steering, throttle response and shift points (on automatic models) independently or based on the 'Standard', 'Sport' or 'Tour' modes, which can be selected by the driver. 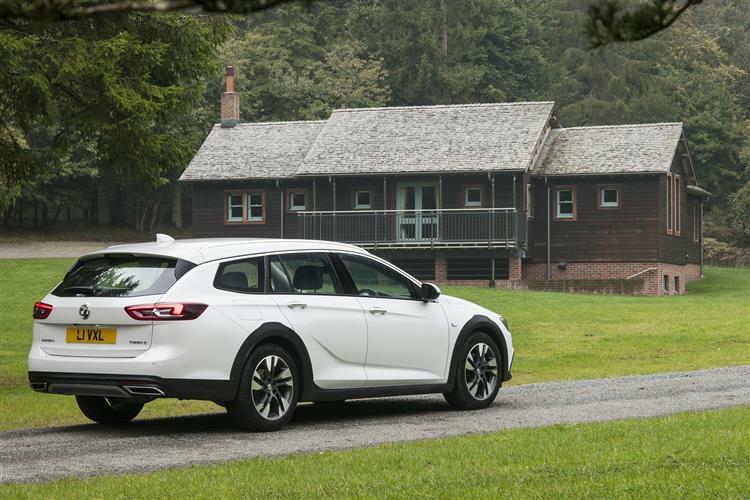 Naturally, you expect a few design cues to distinguish your Country Tourer from a Sport Tourer and Vauxhall delivers them. The prominent landscape grille and slim headlamps give this model a wider look, while the skid plate helps to give the car more of an SUV-style feel. Moulded black protective cladding in the lower fascia, wheel arches and along the lower body side aims to emphasise this model's rugged appearance. The more adventurous design cues continue at the rear too, with a silver-coloured skid plate and dual exhaust bezels. 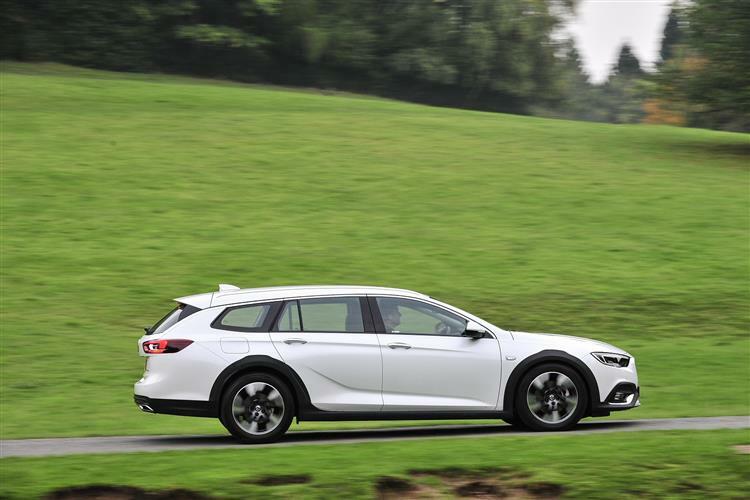 Otherwise, things are much as they would be in a normal Insignia Sports Tourer. 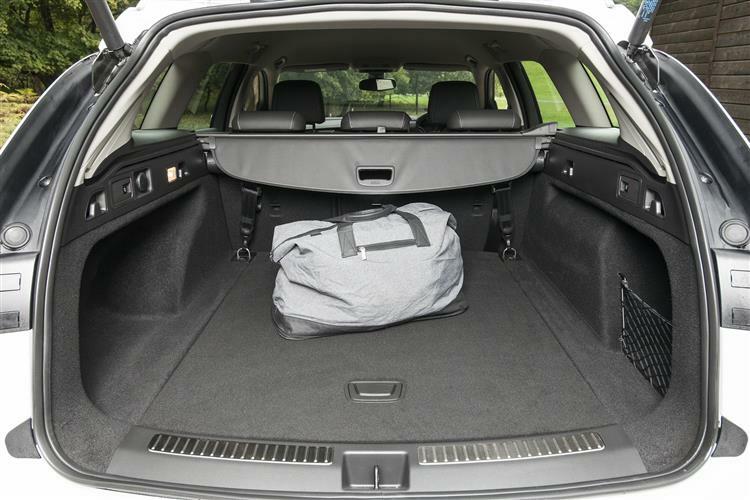 There's a total capacity of 1,638-litres with the rear seats down - 110-litres up on the first generation Country Tourer model. However, the 520-litre capacity with the seats in place is no better than before. The seats themselves can be ordered with a 40:20:40 folding mechanism, while an electric tailgate with foot gesture opening is standard. Vauxhall has also made loading easier with a lower load lip. Up front, there's an enormous improvement over what was served up by the previous model. Fit and finish is almost a match for the premium brands and in the instrument binnacle, there's a smart and configurable 4.2-inch colour monitor, plus there's a sophisticated Intellilink screen on the dash that can be up to 8-inches in size. 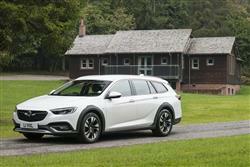 Like its predecessor, this Country Tourer model will sell mainly in the £25,000 to £30,000 bracket. That undercuts rivals like Volkswagen's Passat Alltrack and Audi's A4 allroad. Think of this Vauxhall as closer competition to cars like the Peugeot 508 RXH and the Skoda Octavia Scout. 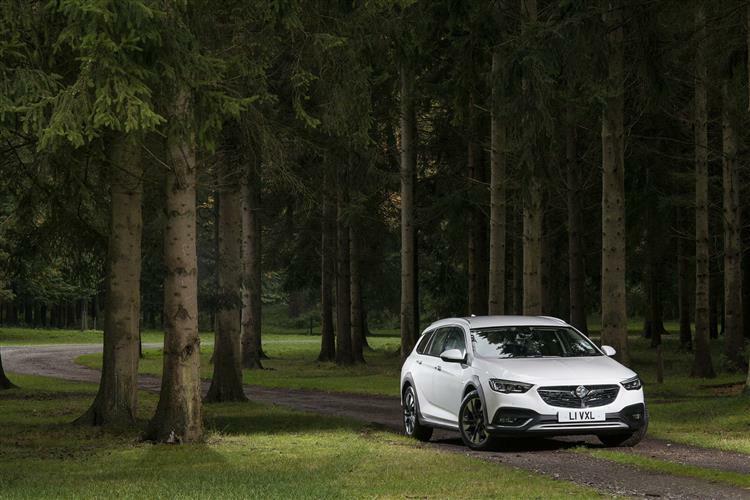 As with its Grand Sport and Sports Tourer siblings, the Country Tourer comes with numerous fresh technology and assistance systems, a good example being the optional adaptive IntelliLux LED matrix headlight set-up which adapts itself to road conditions and other motorists. Further features developed for this second generation model include a head up display, adaptive cruise control with automatic emergency braking, Lane Keep Assist with automated steering correction and Rear Cross Traffic Alert. 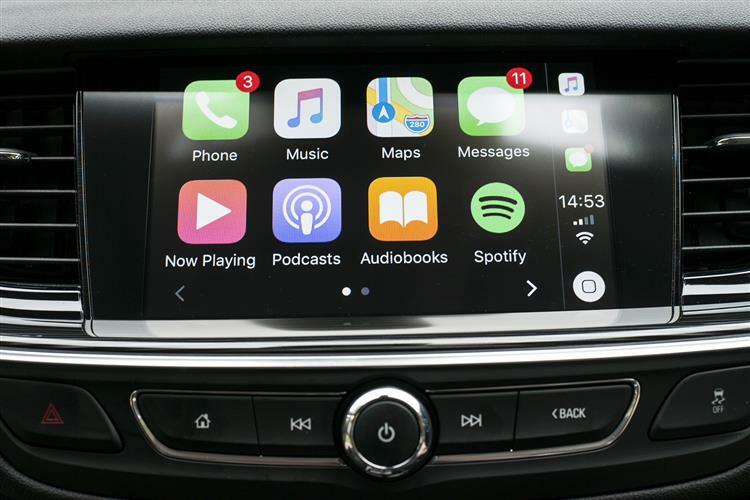 The latest Apple CarPlay and Android Auto compatible IntelliLink systems ensure outstanding entertainment and connectivity, while smartphones can be charged wirelessly and seamlessly integrated with the infotainment system. 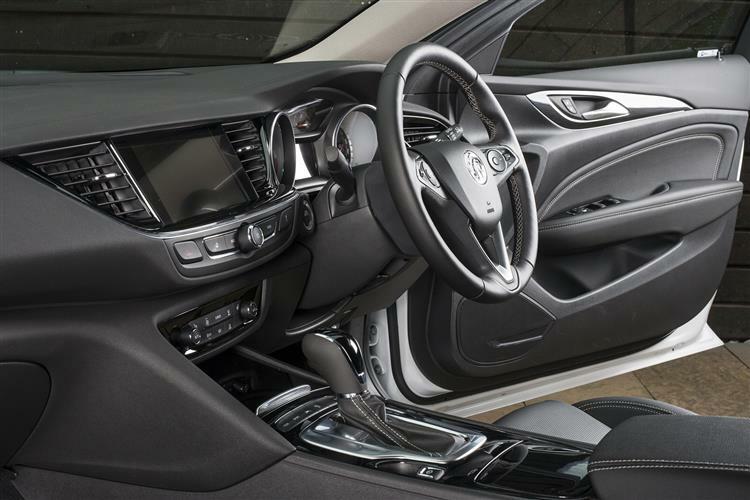 The personal connectivity and service assistant, Vauxhall OnStar, is also on board and offers an extensive service portfolio ranging from automatic crash response to stolen vehicle assistance. Two updates to the OnStar portfolio are the booking service, and parking search, both of which can request OnStar advisors to book hotel rooms and/or search for suitable carparks. Over 70mpg is possible from the 2.0 CDTi unit most Country Tourer buyers will choose. As for residual values, well these will depend on whether the industry recognises this Country Tourer model's shift up-market. Even if it does, the depreciation levels won't match those of premium German rivals. But then, you'll be paying less up-front in the first place, so it's swings and roundabouts. CO2 figures are very competitive, the 170PS 2.0-litre diesel capable of 47.1mpg on the WLTP combined cycle and 150g/km of NEDC-rated CO2. For the 4x4 2.0-litre version, the figures are 42.2mpg and 164g/km. You'll also need to know that Vauxhall includes a three-year, 60,000 mile warranty as standard, a package that can be extended up to five years and 100,000 miles at extra cost. A year's free breakdown cover is also provided, along with a six-year anti-corrosion guarantee. Plus you can opt for a service plan that lets you pay monthly to spread the cost of regular work to your car. As part of this, Vauxhall offers discounts on wear and tear items, such as brake pads and windscreen wipers. 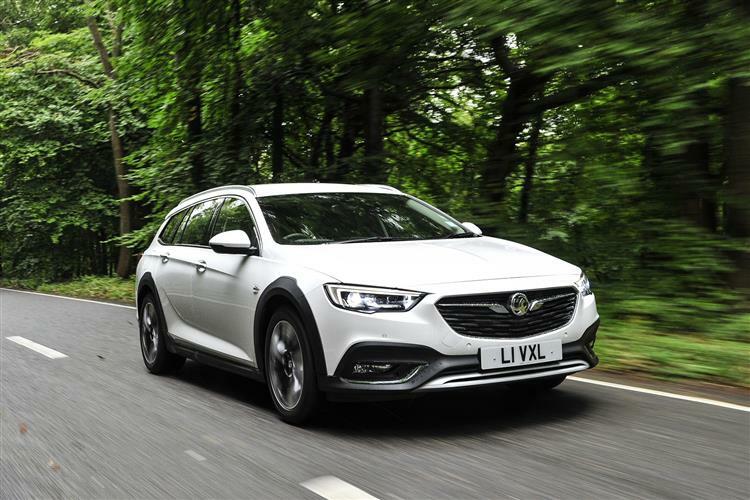 The Vauxhall Insignia Country Tourer is a welcome addition to a market that's got room for a talented mainstreamer with an attractive asking price. Most of the non-premium marques hesitated while looking at this genre of cars because they were clearly so lifestyle, and by extension, badge-oriented, but Vauxhall has built a model that may well have the talent to convince the sort of customer who might never have previously considered an Insignia. The styling's not too overblown, the engines are excellent, the four-wheel drive system is right on the money for the sort of use this model will see and the prices look good and probably have plenty of room for negotiation. There's very little you won't like about the Country Tourer. It's got the chops to worry some significantly pricier rivals. That'll work for Vauxhall.